A taste of Ensenada's new-school fine dining scene in North Oakland. Bert Johnson The drowned fried chicken torta is one of the best, most distinctive fried chicken sandwiches in Oakland. The most enigmatic new restaurant in Oakland sits in a residential section of the Longfellow neighborhood. Apart from a single, tired-looking burrito shop, Salsipuedes is the only dining establishment within a several-block radius. It's a cozy corner shop lined with white tiles and metal stools, like a well-appointed beachside seafood shack. 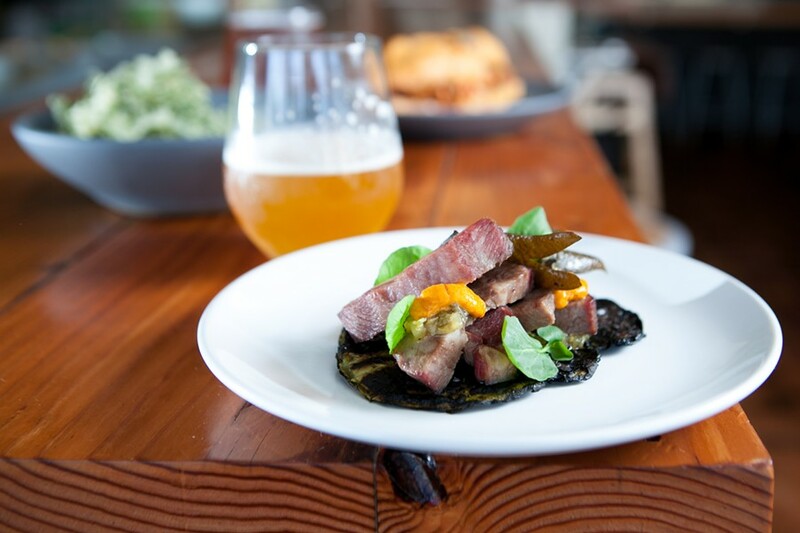 Named after a pristine stretch of Baja California coastline near the city of Ensenada, Salsipuedes (literal translation: "get out if you can") is the brainchild of restaurateur and San Diego transplant Jay Porter, who also runs the farm-to-table sausage and burger restaurant The Half Orange. For his new restaurant, he teamed up with chef Marcus Krauss, ice cream maker Luis Abundis (of the Fruitvale district stalwart Nieves Cinco de Mayo), and Bradford Taylor (of the wine shop Ordinaire). In interviews, Porter has described the concept for Salsipuedes, variously, as "New Baja," "California Rustic," and "seaside barbecue." At the end of the day, the restaurant serves what most Bay Area diners would recognize as a version of California cuisine, in its use of local produce and high-quality meat and seafood. But the restaurant's primary reference point is a culinary movement started in the past decade by Tijuana native Javier Plascencia and a cadre of like-minded young chefs who, at mostly high-end restaurants along the coast of Baja California, started cooking globally inspired fusion dishes designed to make the most of the area's pristine seafood, its ranches, and its excellent produce. The style of cooking, known as "New Baja" or "Baja Med," has yet to make inroads in the Bay Area, but Porter and Krauss figured, why not apply the same principles — so similar to the Cal cuisine we all know and love — to the Bay Area's native ingredients? So, at Salsipuedes, you'll encounter a dizzying array of influences, from Mexico to the Mediterranean and the Pacific Rim — the latter a nod to the impact of the Japanese fishing trade on the Baja region and the area's large Chinese population, Krauss explained. When these disparate elements come together just right, the results can be astounding. Case in point, the drowned fried chicken torta — the restaurant's must-order dish. The chicken itself was breaded and deep-fried, katsu-style, to an impeccable degree of tenderness and crunch, and the kimchi provided just the right amount of complementary tang and funk. Drizzled overtop, Krauss's housemade katsu sauce, less sweet and more loaded with umami than the stuff that comes out of a jar, soaked into torta-style bolillo roll, providing a pleasing contrast between the crunch of toasted surface of the bread and the soggy top — an effect not unlike what you get in a saucy meatball hero. 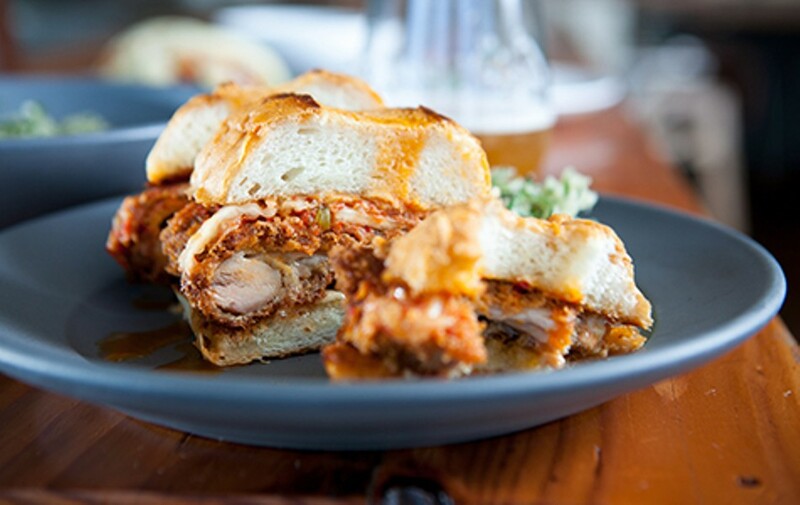 All in all, it's one of the best, most distinctive fried chicken sandwiches in a city that has no shortage of great fried chicken sandwiches. On Tuesdays, the restaurant offers a "burger and fries" special. Twenty bucks buys you the torta, plus a draft beer and a side of tempura sea beans, which looked like strands of wispy green hair caught in a kakiage-style nest — fabulous in its crunch and in how it tasted of the sea — served with a housemade "Kewpie" mayonnaise. You only need to sample a handful of dishes at Salsipuedes to pick up on the chef's obsession with all manner of seaside vegetation: sea beans, seagrass, and several different varieties of seaweed. For instance, an heirloom bean "cioppino" featured clams, fish, and both green and purple varieties of seaweed from the Mendocino coast. The stew didn't have a tomato base and, by Krauss's own account, was less a fish dish than it was a bean dish — one that spoke to the restaurant's commitment to high-quality ingredients: Rancho Gordo beans and impeccably fresh clams, whose juices, in combination with the charred seaweed, infused the soup with an intense brininess. It was an interesting dish, if a bit one-note — in need of some acidity to cut into all those murky, oceanic flavors. Every dish at Salsipuedes had at least one component I found intriguing — an ingredient I hadn't seen before, or a familiar ingredient prepared in a new and unexpected way. But some of the small plates proved to be more interesting than they were delicious. A plate of roasted corn, for instance, was fairly high-concept: The kernels were presented rustically, with bits of the stringy husks strewn here and there, but were topped with seagrass and trout roe that burst in my mouth with a briny pop. The whole mound was crowned with a pale yellow orb that turned out to be not a runny egg yolk or a knob of butter, but instead a scoop of ice cream the flavor of nixtamalized corn — a tortilla in ice cream form, basically. It tasted fine, but once I got past the initial surprise — ice cream in a savory appetizer! — I decided I probably would have preferred the egg or the butter. Surf and turf on a bao. 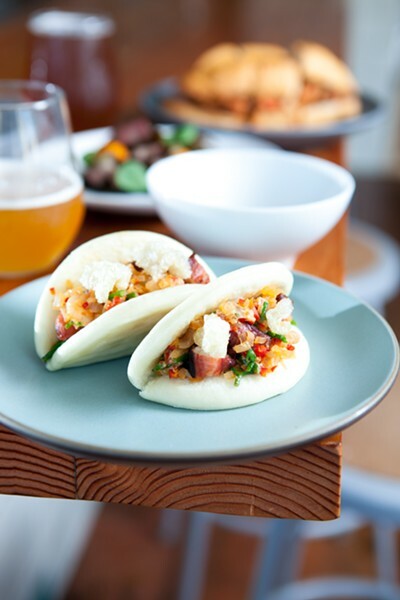 Better was the octopus melt bao, which Krauss explained was his take on the popular Ensenada combination of seafood and melted mozzarella. I liked the tenderness of the octopus and the tiny sautéed shrimp, the porky crunch of the chicharrones, and the appealing oddness of a "salsa" made with chopped-up sea beans, onions, and Fresno chilies. The only flaw was one of execution: The bun itself was stiff and dry, lacking the fluffiness of a proper Chinese steamed bao. And, as much as I admire Abundis' frozen treats at Nieves Cinco de Mayo, if a restaurant is only going to offer one dessert option, it should probably be something that's more of a crowd-pleaser than what was available during both of my visits: rose petal ice cream topped with shiso-infused "tea" and intensely sour pickled strawberries. But dishes that struck the right balance were truly great — as hearty and soulful as they were surprising and technically impressive. The aforementioned beef tongue was a spectacular cold appetizer: thick, mottled-pink slices that were as lush and satisfying as high-quality corned beef. Tiny dabs of uni (I'd have loved more) added briny richness, and the squishy, charred cactus paddle that served as the base of the dish somehow, in this context, evoked the ocean more than it did the desert. And, in what was probably the most entrée-like small plate — pork steak seared hard after a 24-hour soak in the sous vide machine made for a near-flawless dish — I only wished for a slightly brighter counterpoint than what the accompanying sourgrass "chimichurri" provided. Even as communal seating becomes more commonplace, Salsipuedes is striking in the way it takes that approach to an extreme: The only seating is at the large communal table in the middle of the room, or at the counter that winds around the perimeter of the restaurant's open kitchen. The idea, Krauss explained, is for diners to feel like they've been invited into his home for a meal. That's a nice sentiment — one that was reinforced by the attentive and conscientious service. And Krauss, for his part, is the kind of dinner host who's egging on his guests to try something new. If you're up for the adventure, it's some of the most interesting food in town.